How to start simple, basic dog training classes with local friends; no pressure, great fun and a useful activity for all! We often want to get into some dog activities but just don't know how. When asking about how one does this you are directed to the AKC website, or to the UKC website, where you find no information about classes, clubs, or matches in your area. By definition most dog people aren't in a city situation and no resources exist in many rural locations. If you can't find anything, don't give up in frustration and let your dog continue to sit in the yard or kennel while you sit on the couch. Go out and make something happen! 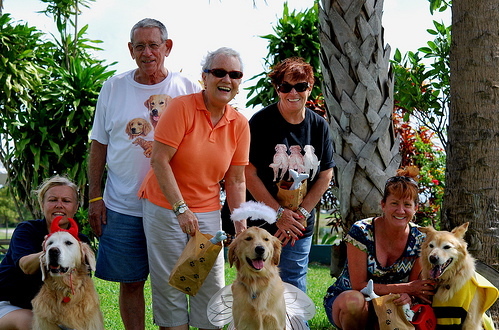 In our little town there are several dog people, mostly older women, who wanted to do something but didn't know what. So we started a multi-goal obedience class. The requirements for Beginner Novice obedience, Rally Obedience, and CGC are very similar. So what we decided to do is work toward all three beginner titles in 6 weeks. Will it work, who knows, but at the very least we are all getting off the couch and doing something with our dogs. 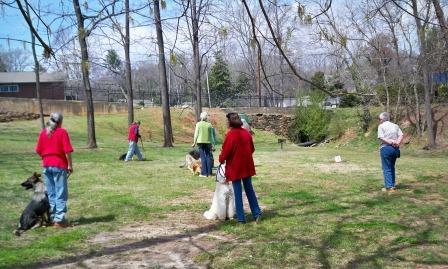 The socialization opportunities are great for the dogs as well as their owners. Heeling can be taught with any type of collar, with or without food, and by anyone. The object is to have fun. Once they are walking nicely you can teach the automatic sit. The “sit” is easy and the automatic part is to make it part of every halt. Our program begins with setting up the course with a pylon and a start sign. At the other end of the course use a left turn sign. At the end of the course a halt. We also call out the commands so our handlers will know to both follow instructions verbally and to follow the signs. Every week we add in two signs and teach how to perform the exercises. Every week is a mini CGC (Canine Good Citizen) test! Each week the intensity increases and likewise the precision. When a student/dog team thinks they are ready for a CGC test we let them try. If they pass it is a cause for celebration, if they need more training they are already in the class and we know just where we need to concentrate for that dog. By the second week we have gotten the heel and automatic sit down and the down has been introduced, as shown here. The handlers know how to follow a 4 sign course, the dogs are accustomed to other dogs and they are expected to "sit" or "down" quietly while another dog is working. In our first course we had 100% pass. 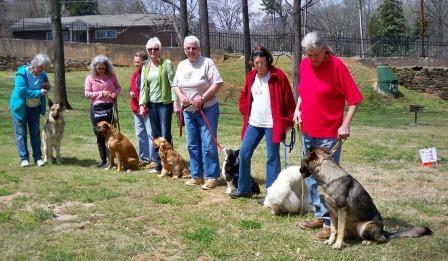 We have good attendance at our latest class, I expect all the dogs to pass. We haven’t had any dogs trial for the Beginner Novice or Rally Obedience yet as there haven’t been any trials in the area. In every community there is someone who at least knows the basics. Make them the class leader. Keep it short, keep it simple. You are likely to find that the participants actually like doing something with their dogs and want to continue on to more advanced work. If your dog friends want to herd you can begin the herding commands without stock. This is a good start while someone is getting stock and working on finding a location. If your friends want agility you can also start small. No one needs to buy expensive objects, you can make a pause table, use cones for objects, use any object, such as a table turned on its side, anything to teach the basic commands and skills. No more excuses, just get out and do what you can. If one waits until everything is perfect nothing will ever get done.